So , you got trouble, and that starts with T, which stands for Smart TV, and no, I’m not going to write this whole blog post as a Music Man parody. This post is advice on handling a poor wifi signal, which is a common problem, and nothing to be ashamed about. 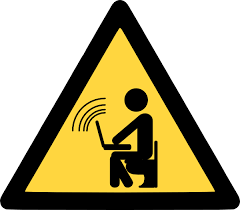 Poor WiFi is a leading cause of Electronic-Magnetic-Spectrum Dysfunction, commonly known as E.D. Yeah, just take my word on that. Use it in lots of conversations. Don’t look it up. It will be fine. Basically, your wifi performance is affected by 3 things. 1) signal strength- Easiest fix is move the router closer or reduce obstructions. If you can’t move your tv to the basement or knock out a wall, you’ll have to find other ways to improve it. You can increase your effective broadcast power sometimes (through router configuration) or by changing your antenna to something bigger, something better positioned (e.g. with a wire letting you move it higher), or more focused. Actually, forget most of those options unless you’re setting up wifi for a college campus. For your house, you’ll probably just want to EXTEND your wireless network by running a wired connection to somewhere closer to your area of poor signal strength. The traditional way is to run an ethernet cable from one end of your house to another, and plug in another wireless router there. That isn’t always the neatest solution, so I can also recommend ‘powerline’ adapters, which route point-to-point between the routers. If your target device has an ethernet input, of course, you could just skip the second router and connect that to the powerline adapter. You can also change the wifi protocol you use, but this generally means a new router, and you have to check what’s compatible with your connecting devices. The most common protocols are b, g, and n. 802.11b (the oldest) has the LONGEST range, actually, though the lowest throughput, so don’t assume a new protocol will solve everything. 2) interference- In the beginning, there was 2.4ghz, and it was good. It was also used by your phone, microwave and maybe your vacuum. Your router may have a tool that will perform spectrum analysis on your environment. Improving your signal may be as simple as changing what channel your router uses. If you can’t find a healthy channel for your wifi,then consider switching to a protocol that uses a different chunk of spectrum. 5ghz is the other typical option. The most common protocol that uses 5ghz is 802.11n. IMPORTANT NOTE: there are always new protocols coming out. Before you buy them, make sure your devices are compatible with them. 3) congestion- Have a good signal, but your Netflix still takes longer to load than a revolutionary war musket? (I’d love to update that metaphor, but can’t think of any else slow loading.) Well, you may just have signal congestion, multiple devices all competing for your internet bandwidth. The obvious answer is reducing the number of devices, but if you can’t convince the kids to take up meditation while you have a marathon Dexter watching binge, then check if your router supports ‘bandwidth management’ which will allow you to dedicate or prioritize traffic for specific purposes or devices. This way, for instance, your movie torrent downloads won’t disrupt your snapchat sessions. Sorry, I mean your open source software downloads won’t disrupt your skype condolence calls to widowed orphans. If all else fails, of course, move somewhere google is your ISP, and get fiber-optic cables run throughout the entire house. P.S. If you DO decide to replace/augment your router, then I recommend a ‘tomato’ capable router. http://en.wikipedia.org/wiki/Tomato_(firmware)#Compatible_routers. I’ll probably write something up at some later date about the advantages of a Tomato router.